Instant messaging’s been a part of my life since I first created an AOL Instant Messenger account back in 1996. Nowadays I use it to keep in touch with both far-flung friends and colleagues. As it’s a personal social tool and a necessity for work, it’s the kind of thing that I like to have access to no matter where I am. AOL’s free AIM client for the iPhone ( ) is pretty good, but for those in search of a more powerful alternative there’s BeejiveIM from Beejive. BeejiveIM is an incredibly full-featured IM client, boasting capabilities that almost put it on par with desktop IM clients. For me, its biggest advantages over the AIM client are its compatibility with multiple IM services, such as AIM, Yahoo Messenger, MSN Messenger, GoogleTalk, ICQ, Jabber, and even MySpace, and its ability to let you log in to multiple IM accounts simultaneously. The Missing Link: BeejiveIM lets you assign real life names to your buddies, but it doesn't link them up automatically. Since I use IM for both work and personal reasons, I maintain two separate accounts, but I’m usually logged on with both. In AOL’s AIM client for the iPhone, switching accounts is a hassle that requires quitting the application, going to the iPhone's Settings app and changing the login credentials manually. Beejive lets me enter login information for multiple accounts and I have control over them either individually or as a group—say, if I want to change my status message. 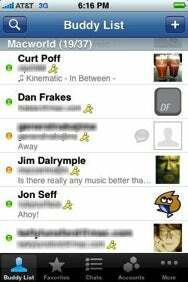 Beejive’s buddy list can display contacts in several different ways, including displaying groups, sorting by display name or status, and hiding offline contacts. By tapping on the More button on the bottom toolbar, you can also view just the contacts for a certain account or group. Contacts can be marked as Favorites, which lets you view them by tapping the Favorites button on the toolbar, similar to the iPhone’s Phone app. You can also search your buddy list by tapping the magnifying glass icon at the top left and entering a search term. Unfortunately, even though Beejive does let you associate a buddy with a contact in your Address Book, such links must be made manually, by bringing up the buddy’s profile, tapping Link to Address Book Card, and selecting a contact. Even then, it doesn’t associate the person’s real name with the account—you’ll still see their screen-name unless you take the time to tap on the Nickname field in their profile and enter a friendlier label. Once you’ve linked an Address Book contact with the profile, you can tap a button to view the card, which acts like the iPhone’s contact app: you can tap an email address to launch Mail and send that person a message or a phone number to initiate a call. When it comes to chatting, Beejive offers a number of powerful features: you can send images and sound recordings to your buddies; you can also send an e-mail containing a log of the chat. The cost of packing in all these features, however, is an often confusing and unintuitive interface. Beejive opted to simply hide many parts of the interface. For example, the controls for recording a voice snippet or selecting a picture are only accessible when you’re in a chat; that's OK, but there's no obvious button to trigger them. Instead, you need to tap the name of the person you’re chatting with at the top of the screen and a transparent panel slides down with additional controls. But there’s no visual cue to indicate that there’s more functionality hidden there, and no way of knowing that they're possible without reading the instructions on Beejive's Web site. It’s a decidedly un-iPhone-like mechanism. Chatting can be similarly confusing. While the interface's colorful dialog balloons mimic iChat and the iPhone’s SMS app, there is no obvious text field for composing messages. Instead, you have to tap on the the screen to bring up the keyboard, and then you need to start typing in order to bring up a weird translucent balloon that displays what you're typing. And while tapping on the screen brings up or dismisses the virtual keyboard, it does so by hiding the toolbar at the bottom, which can be frustrating. Better would have been for Beejive to simply get rid of the toolbar in the chat mode, since it's kind of superfluous there anyway. Despite the interface, the file transfer aspects of Beejive work pretty well. You can send buddies pictures (either from the iPhone’s Photo Album or taken with the camera) or voice notes (via a built-in voice recorder); for the latter, your buddy will get a hyperlink to your file, which is uploaded to Beejive’s servers (probably not something you’d want to do for sensitive material), but for photos you can choose between sending a link or sending the file directly. Beejive’s file receiving capabilities are much more powerful, however: you can receive pictures, sounds, and other files that the iPhone can view (Word documents, PDFs, and so forth). The only problem is that once you receive a file in Beejive, you can’t do anything other than view it or forward it to another contact via IM or SMS—you can’t e-mail it to yourself or save a picture to your Camera Roll. There are a handful of other features that Beejive sports that some users might find handy: you can flip the iPhone and chat in landscape mode, enable an option switch back and forth between chats by shaking the phone, insert emoticons into your chat, and even change the background picture of your chat. The only minor problem I encountered was that Beejive's Buddy List doesn't show the AIM Blast groups I use to communicate with some of my colleagues. I could receive messages for the group and, once I’d received a message ,I could reply to the group, but I couldn’t send a message to the group without receiving one first. From a functionality standpoint, BeejiveIM is certainly a very capable IM client with features above and beyond those of much of its competition. Its unintuitive interface can be frustrating at times, but that diminishes over time, and while its price tag might be off-putting to some, it comes down to how much you need the powers that Beejive can offer you. BeejiveIM is compatible with any iPhone or iPod touch running the iPhone 2.x software update.